Note: Advanced sales only. Out of stock until October. Pumpkin Light Set. 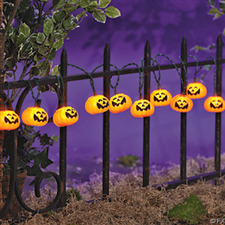 Greet trick-or-treaters with this 30" string of plastic pumpkin lights! 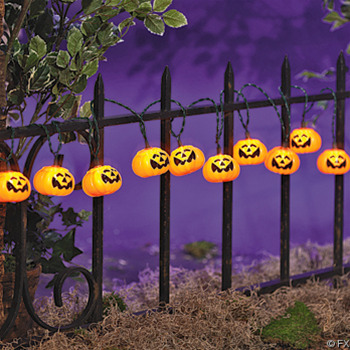 Hang them indoors over a doorway, in a window or near your Halloween party buffet table. Add them to your outdoor décor to lead trick-or-treaters to your door. If one bulb burns out the rest of the string stays lit! With 10 lights. For indoor or outdoor use. UL listed. Light strings interconnect.